York County Heritage Trust Sanctioned Civil War Guide Scott Mingus is standing on on North Front Street near the Wrightsville Lime Kilns. This view was taken facing northwest at approximately 3:45 PM on Sunday, September 13, 2009. Scott L. Mingus, Sr. is a scientist and executive in the paper and printing industry, and holds patents in self-adhesive postage stamp products and in bar code labels. 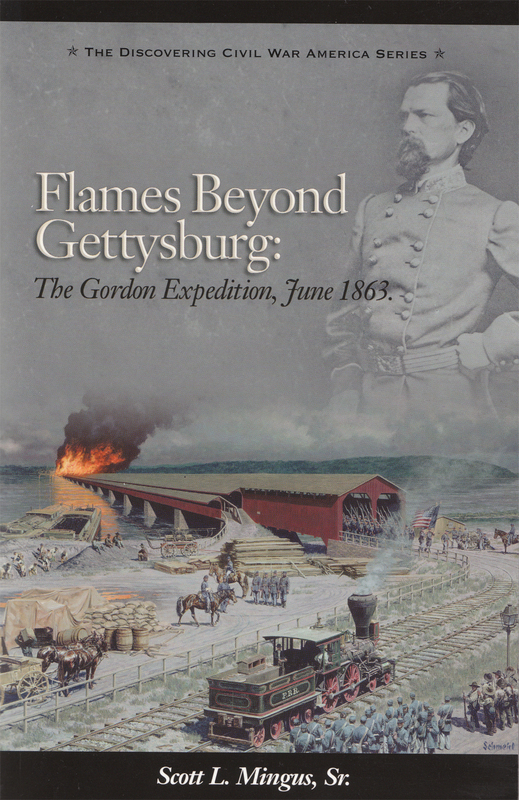 He has written six books on the Civil War, including Human Interest Stories of the Gettysburg Campaign (Volumes 1 and 2), Human Interest Stories from Antietam, and Flames Beyond Gettysburg: The Gordon Expedition, June 1863. His latest book, A Spirit of Daring: Hays’ Louisiana Tigers in the Gettysburg Campaign, was published in October by LSU Press. In the works is Gettysburg Glimpses 2: More True Stories from the Battlefield. Mingus also has written several articles, including in The Gettysburg Magazine. He maintains a blog on York County, Pennsylvania, in the Civil War for the York Daily Record (www.yorkblog.com/cannonball/), and he is a sanctioned Civil War Guide for the York County Heritage Trust. 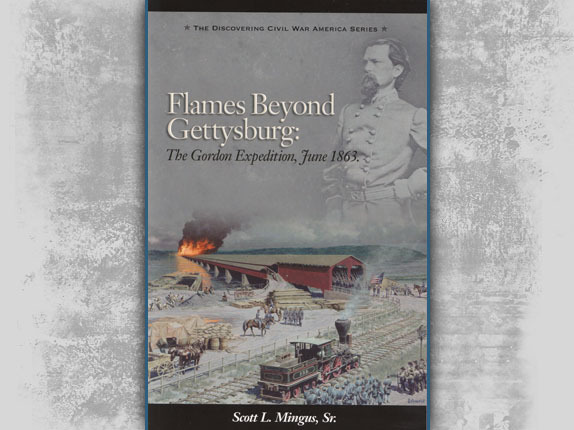 Mingus has written several booklets on wargaming the Civil War, including the two-volume Enduring Valor: Gettysburg in Miniature, the popularly acclaimed Undying Courage: The Antietam Campaign in Miniature, Touched With Fire, and Crossed Sabers: Gettysburg in Miniature. His latest work, Brothers Divided, features a dozen new scenarios from the Gettysburg campaign. He and his wife Debi publish Charge!, the leading international fanzine for ACW miniature wargaming. A native of southeastern Ohio, he graduated from Miami University after majoring in Paper Science and Engineering. Mingus spent 23 years working for office products giant Avery Dennison in the Cleveland area before joining Glatfelter, a global manufacturer of specialty papers, in 2001. 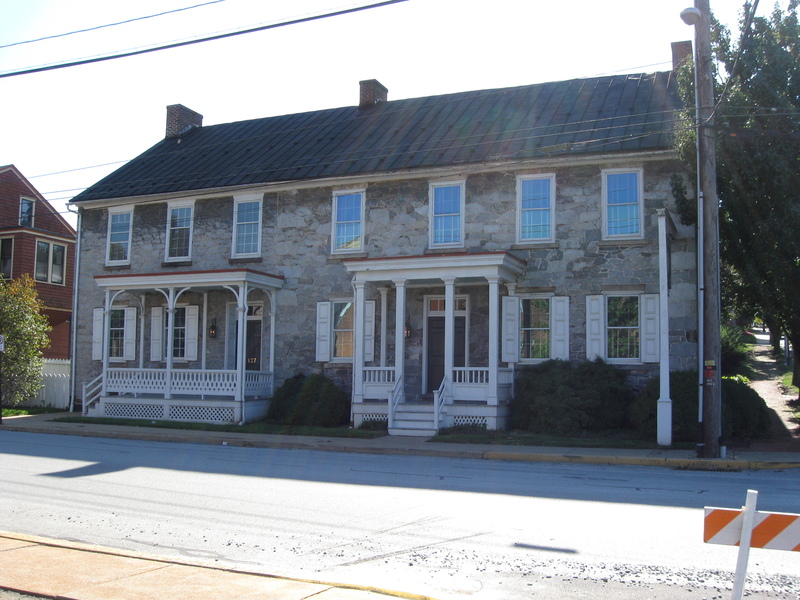 He and his family live near York, Pennsylvania. 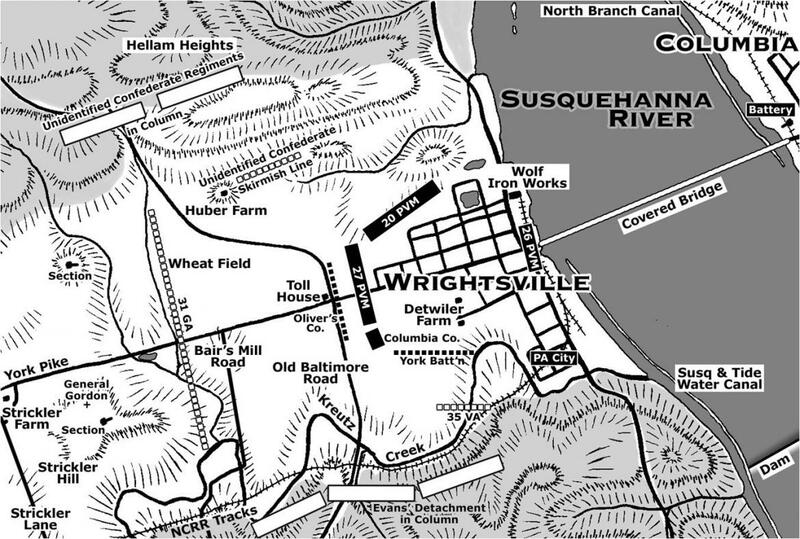 In our first Wrightsville post, Scott Mingus brings the forces to Wrightsville, and shows us how the Confederates advanced on the Union defenses. 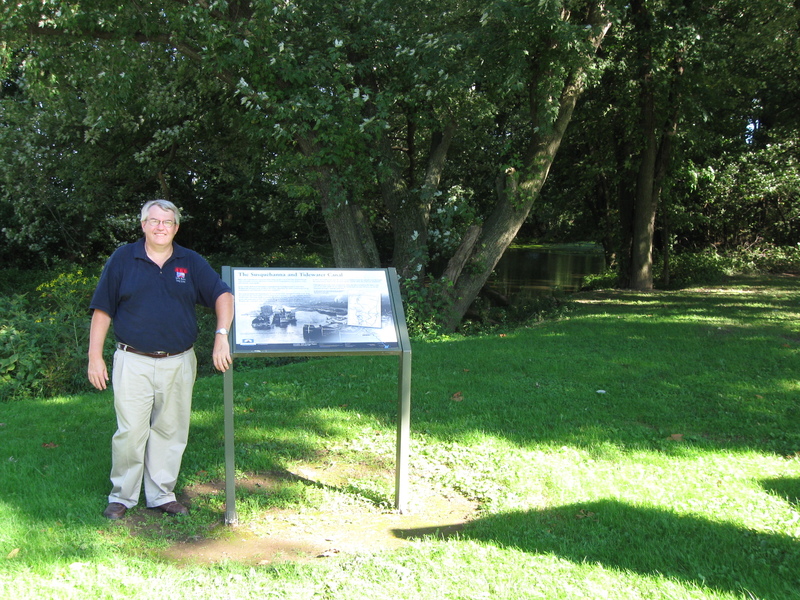 In our second post, York Heritage Trust Civil War Sanctioned Guide Scott Mingus shows us the location of Bair’s Mill and the location of the Union skirmish line. In our third post, York Heritage Sanctioned Guide and author Scott Mingus showed us the Wrightsville Battlefield, west of the town. In our fourth post, author Scott Mingus shows us where the Confederates broke through the Wrightsville defenses south of the town, describes the artillery used, and the contributions of African Americans to the battle. In our fifth post, Scott Mingus showed us the piers to the covered bridge over the Susquehanna River, and described the burning of the bridge and the attempt to save the buildings in Wrightsville from the fire. 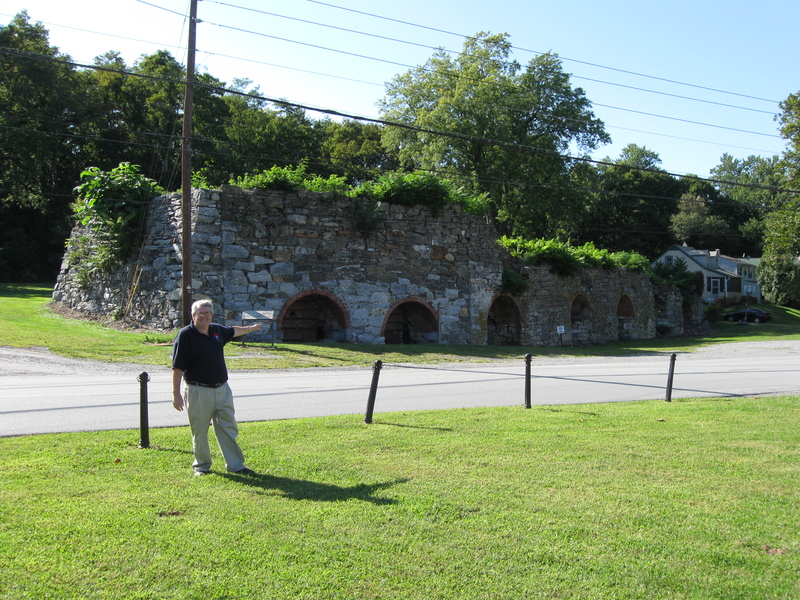 In today’s post, Sanctioned Guide Scott Mingus shows us the Wrightsville Lime Kilns, a building the Confederates saved from fire, and the Susquehanna Tidewater Canal. This map shows the location of where our Wrightsville videos were produced. Video #1-#6 were shown in our previous Wrightsville posts. Videos #5 and #6 were taken at the intersection of the Lincoln Highway and Cool Creek Road. Videos #7 -#9 were taken on Cool Creek Road near the Rutter’s convenience store. Video #10 was taken at Meadow Lane, south of Wrightsville. Videos #11 and #12 were taken at the intersection of Hellam Street and 4th Street in Wrightsville. Videos #13- #15 were taken on the banks of the Susquehanna River in view of the remains of the Civil War bridge. Video #16 was taken near the Wrightsville Lime Kilns. Video #17 was taken near a house at the junction of Front Street and Locust Street. 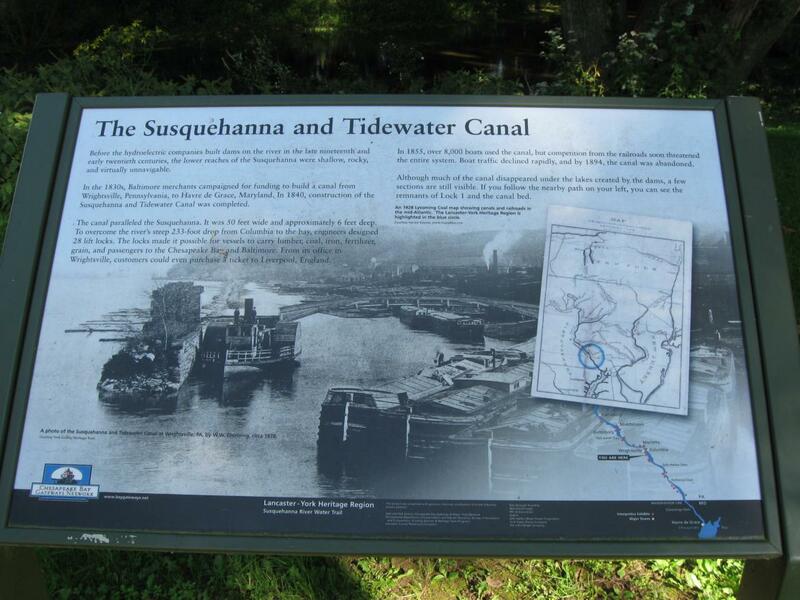 Video #18 was taken at the Susquehanna and Tidewater Canal. This map was created facing north at approximately 6:00 PM on Saturday, September 26, 2009. This map shows the units defending Wrightsville and the position of the Confederate units as they advanced on the defenses. Copyright Scott L. Mingus, Sr.; drawn for Flames Beyond Gettysburg by Tom Poston. All rights reserved. 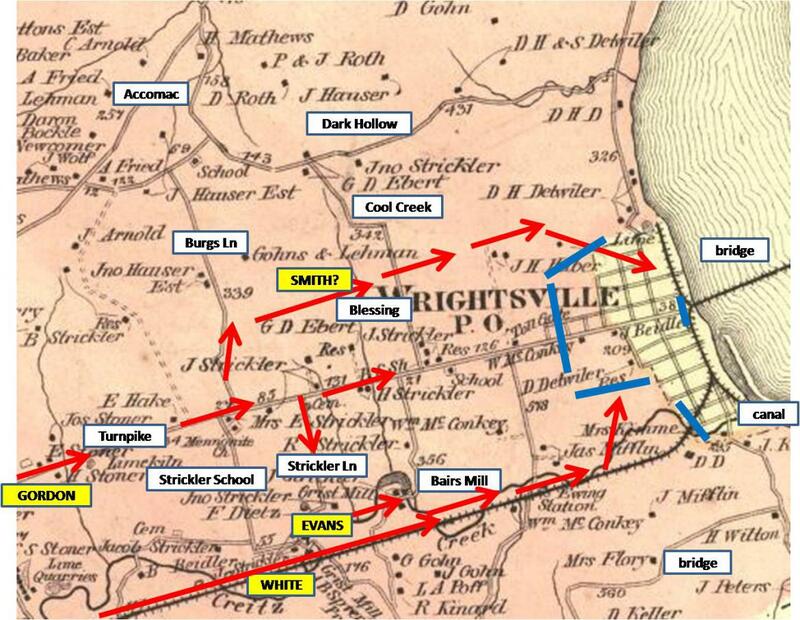 This 1876 map of Wrightsville shows landmarks, Confederate troop movements in red, and the Union defenses in blue. This map was created in 1876. 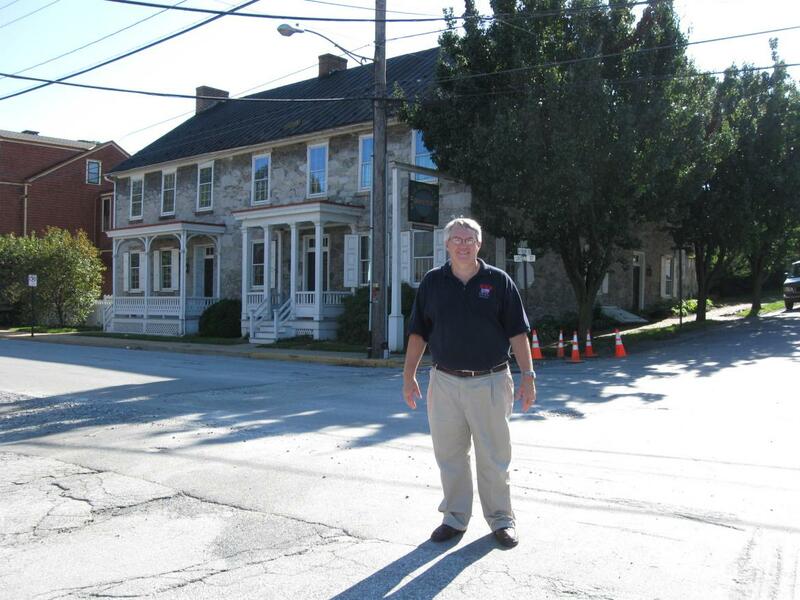 In Video #16 (Videos #1- #15 were shown in our previous Wrightsville posts) York County Heritage Trust Sanctioned Guide Scott Mingus is standing near Front Street on the west bank of the Susquehanna River. He shows us the remains of the Wrightsville Lime Kilns. This view was taken facing west to northeast to west to southwest at approximately 3:45 PM on Sunday, September 13, 2009. 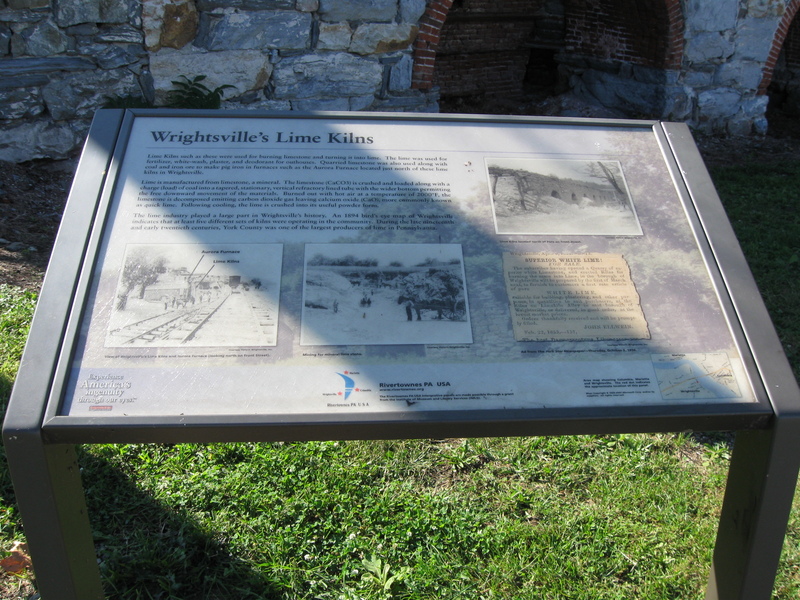 The wayside at the Wrightsville Lime Kilns. This view was taken facing northwest at approximately 3:45 PM on Sunday, September 13, 2009. Sanctioned Guide Scott Mingus is standing at the corner of Front Street (running right to left) and Locust Street in the right background. This view was taken facing southwest at approximately 3:45 PM on Sunday, September 13, 2009. In Video #17 Sanctioned Guide Scott Mingus is standing on Front Street at its junction with Locust Street on the west bank of the Susquehanna River. He shows us the Wrightsville House, a private residence which before the Civil War was a popular hotel. This view was taken facing southwest to west to southwest at approximately 3:45 PM on Sunday, September 13, 2009. The Wrightsville House, although a private residence during the Civil War, was an old tavern that was popular well before the Civil War. Some accounts suggest that Confederate soldiers climbed onto the roof to help pass water to douse flaming embers that kept blowing onto the flammable shingles. This view was taken facing southwest at approximately 3:45 PM on Sunday, September 13, 2009. Scott Mingus is standing at the Susquehanna and Tidewater Canal, which is the water in the background. This view was taken facing southeast at approximately 3:45 PM on Sunday, September 13, 2009. In Video #18 Scott Mingus is standing on the west bank of the Susquehanna River near the Susquehanna and Tidewater Canal. He describes how this was a heavy industrial area, and how Ira Shipley could not have the contents of his railroad car escape John B. Gordon’s Confederates. This view was taken facing southeast to northeast at approximately 3:45 PM on Sunday, September 13, 2009. The Susquehanna and Tidewater Canal wayside. This view was taken facing southeast at approximately 3:45 PM on Sunday, September 13, 2009. Scott Mingus’ book on John Brown Gordon’s expedition through south central Pennsylvania is Flames Beyond Gettysburg: The Gordon Expedition, June 1863. It is published by Ironclad Publishing Inc. 6258 Olde Orchard Dr. Columbus, Ohio 43213. This cover was scanned facing north at approximately 8:00 PM on Monday, September 14, 2009.